Understanding the causes of interannual variability in atmospheric pollen concentration is an important but elusive goal for public health and environmental change. 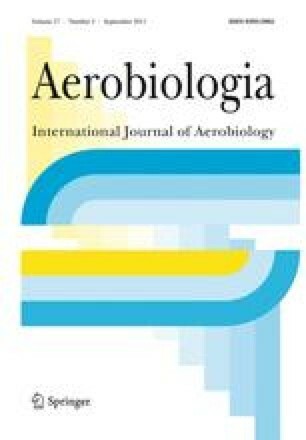 We analyzed long-term daily records of pollen counts from urban Kansas City, Missouri, USA collected from 1997 to 2009 for three pollen groups: Ambrosia, Poaceae, and a third group which is mostly composed of arboreal pollen types. The annual pollen index varied from 8,368 to 80,822 over the thirteen-year period. Although Ambrosia pollen is often thought to be associated with droughts and disturbance, years with high Ambrosia pollen were associated with high summer precipitation to the south of Kansas City. Years with high Poaceae pollen were associated with high spring precipitation to the south of the city. In support of the southern influence to Kansas City pollen, Ambrosia and Poaceae pollen mostly arrived on southern winds. In contrast to the other two pollen groups, the arboreal pollen was most associated with growing season precipitation to the east of Kansas City, although it was still highest on days with southern winds. Based on the correlations with climate, the severity of an upcoming allergy season may be predicted with early-season precipitation data, while short-term severity can be forecast from local weather patterns. We thank Julie Commerford for providing cartographic assistance. Jay Portnoy, Julie Landuyt, Freddy Pachecho, Frank Hu, and Minati Dhar provided the original pollen data from Children’s Mercy Hospital. Mary Knapp provided data from three weather stations. Konza Prairie Biological Station provided weather data from Kansas. We appreciate helpful discussions with Doug Goodin and John Harrington Jr. This research was supported by grant BCS-0821959 from the National Science Foundation to K.K.M. The data collection has been supported at times by Marrion-Merril-Dow and the Kansas City Allergy Society and throughout its history by Children’s Mercy Hospital.